I would also prefer to have a real archive system for articles, elxis 4 has it but is global archive..not allowing to choose which article to send to archive. è possibile avere una copia di installazione sul server del CMS Elxis 5 per poterla provare? Is it possible to have an installation copy of the Elxis CMS 5 server in order to try it? Elxis 5.0 is under development and not yet available even as a BETA version. Why we still need to distinguish between modules and components? As from users perspective, there would be very little yo NO-need for this differences, as there is no really a difference visible, when installing/enabling .... and if still, then a note [m] or [c] would not suffice? I am also a fan of simplicity and, ideally, I would prefer to have just 1 type of extension but it cannot be done without loosing functionality. Also this would change dramatically Elxis features, you wouldn't be able to do the things you do now. I will explain the purpose of components, plugins and modules below and I am sure you will understand. Note that there are also other type of extensions like Search Engines, Authentication methods and Templates. There are also third party components that have their own types of extensions. Elxis router sees that after the site's base url (example.com) a segment called "shop" exists. It checks installed components and finds out that component com_shop (Open Shop) is installed and so it forwards the request to component com_shop. Component Open Shop will continue analyzing the URL afterwards. Without components Elxis would have no pages! Plugins are special type of extensions ONLY for component Content. They work by replacing blocks of code with html code within article's text area. Example. You type: [gallery]something[/gallery] and the gallery plugin replaces it with an actual image gallery. Modules have not their own URLs (pages) like components do. You cannot call a module from the URL. Modules are html blocks (like boxes) that usually are been displayed around the main part of the page which generated by the component. They usually contain supplemental information, navigation, or provide special functionality (login, change language, menu, etc). Modules can be displayed to all or to specific pages generated by the components. If modules didn't exist then in case you would like to display something on the sidebar this should be done by the component. So the component should have the functionality to generate anything you want in the side column for example, create site menus, display login form etc. And this functionality should exist in ALL components. So if you wanted to display the weather in the site column of your site on a page which lists component's Open Shop products then Open Shop should have the weather functionality built in! Strange thing for a shop application, right? By having an independent extension type, the modules, you can display what ever information and provide additional functionality to any page, in any position, regardless of the page's main contents. Ib fact, I am often confused, was it a module or a plugin .... and modt of the time, I am just searching for the right group. Elxis 5.x development progress so far. - WYSIWYG editor (if we changed it we must re-create the plugins intergration system and also the media manager). The rest administration pages are Elxis 5.x ready! I post 2 screenshots from the list of articles page which is the last section finished. The first one is as seen from a desktop computer and the second one is the same page as seen from a mobile phone. The current status of Elxis 5.x development. 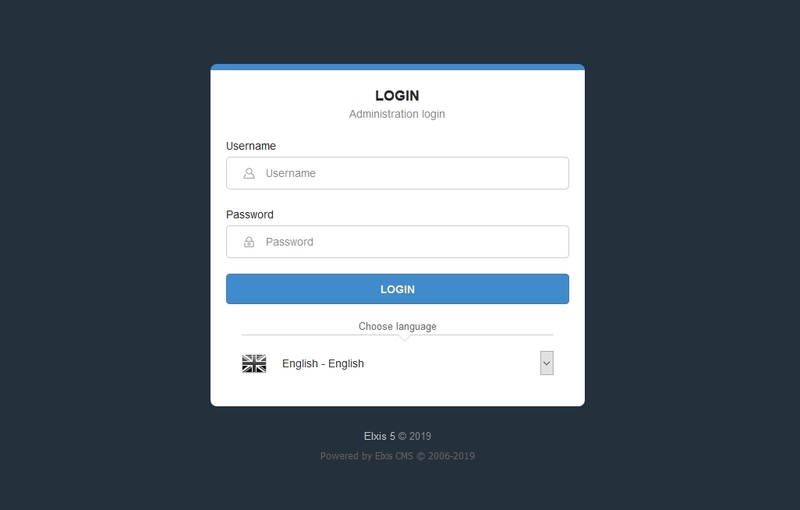 Elxis 5.x administration panel is ready and fully functional (and mobile friendly!). New form creation library "elxis5Form". (the old elxisForm updated and kept for backwards compatibility). Elxis 5.x standard CSS classes use the "elx5_" prefix (old "elx_" css classes either removed or kept for backwards compatibility). The above are only a few of the changes in Elxis 5.x. Although Elxis 5.x does not bring too many new features it is a full redesign of the Elxis interface. Most new features will come later with the Elxis 5.1 and 5.2 releases. On February 2019 version DEV1 was released (private release). In about a week version DEV2 will be ready for testing. After DEV2 we will perform some final tests, last improvements/additions and fixes if needed and release Elxis 5.0 to the public. Stay tuned! I would like to ask if it is possible to have some sort of note insertion for admins to insert a message regarding the use of a control panel program function. I don't know if this can be done for Elxis 4.x as an add-on but may be for 5.x. This might be useful for admins to leave a note for regular users as well. Hi Peter. There is a module available for this purpose titled "Sticky notes"